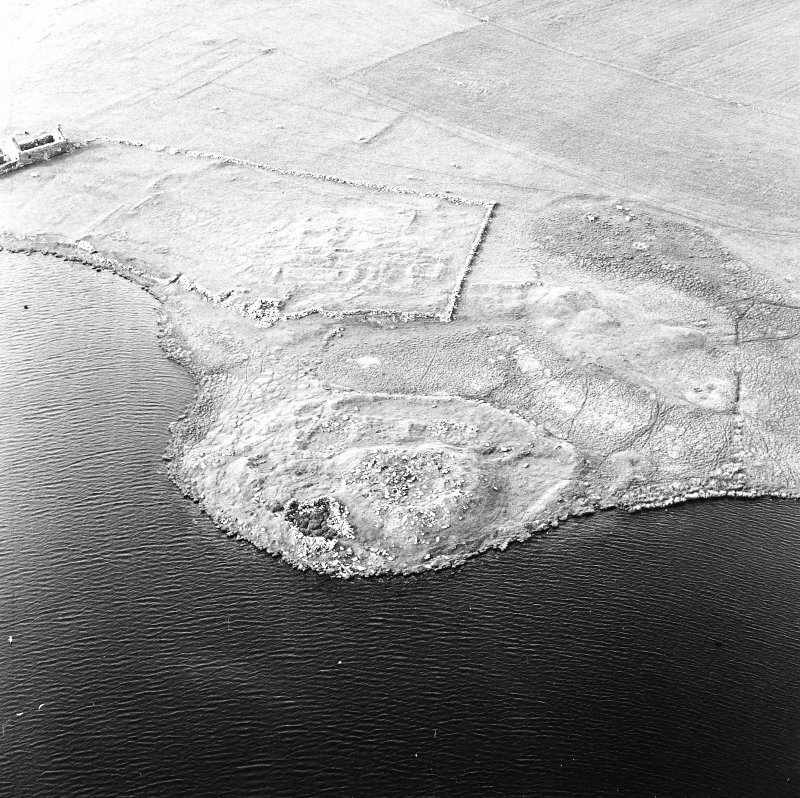 Oblique aerial view centred on the remains of the broch with the remains of the buildings and burnt mound adjacent, taken from the SW.
Oblique aerial view centred on the remains of the broch with the remains of the buildings, burnt mound and croft buildings adjacent, taken from the ESE. 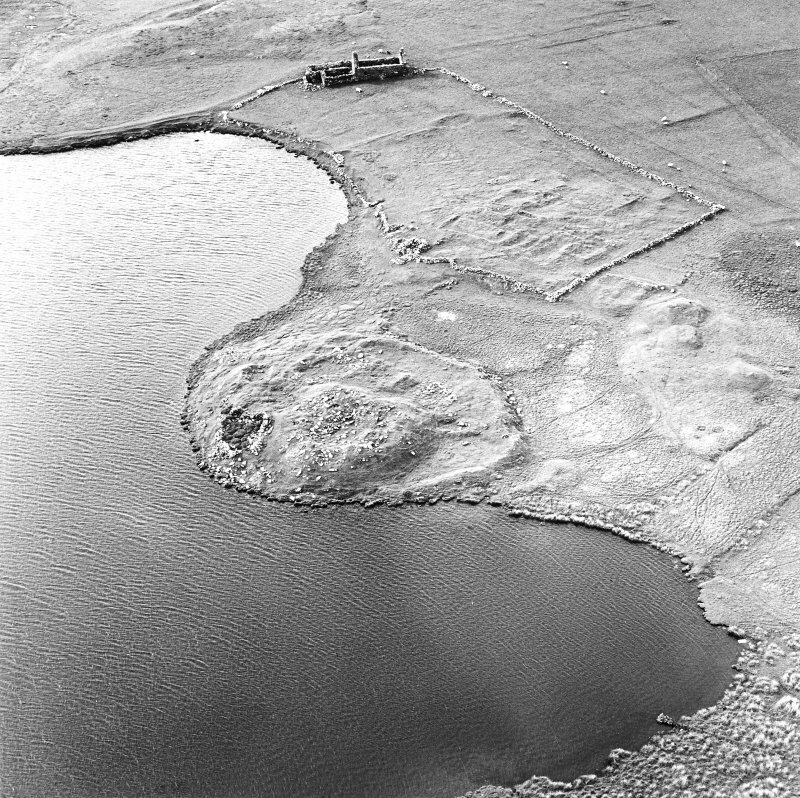 Oblique aerial view centred on the remains of the broch with the remains of the buildings and burnt mound adjacent, taken from the ENE. 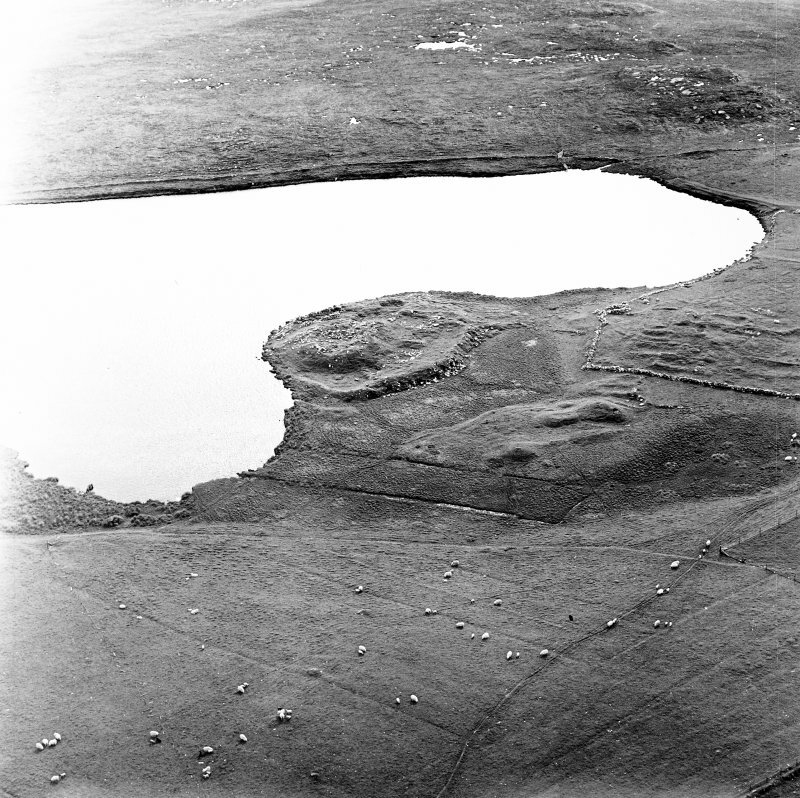 Oblique aerial view centred on the remains of the broch with the remains of the buildings and burnt mound adjacent, taken from the S.
Oblique aerial view of the Loch of Snabrough Broch and the farmsteads, looking NE. 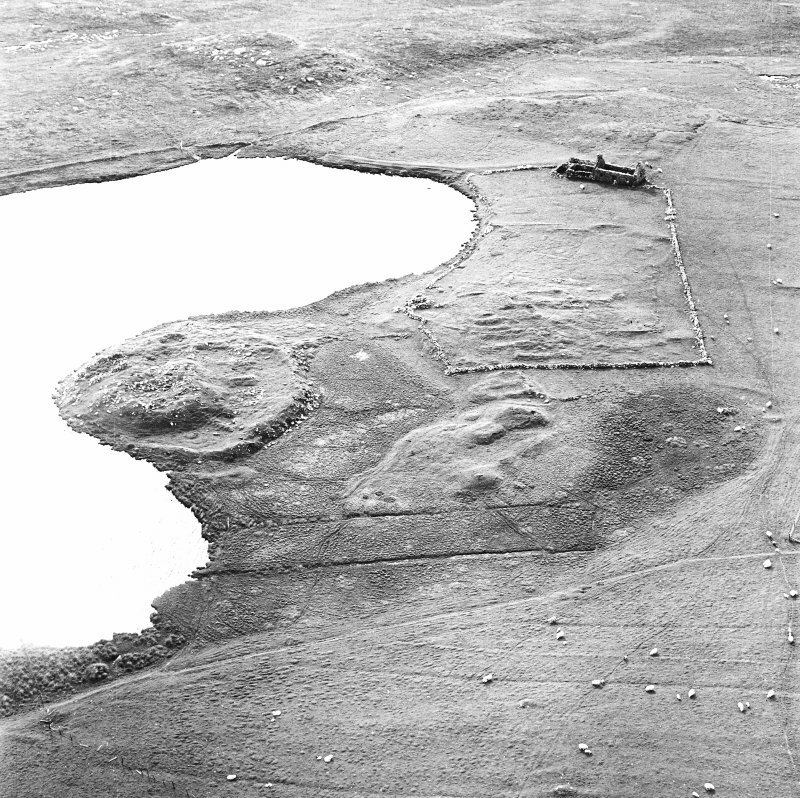 Oblique aerial view centred on the remains of the broch with the remains of the buildings, burnt mound and croft buildings adjacent, taken from the SE. 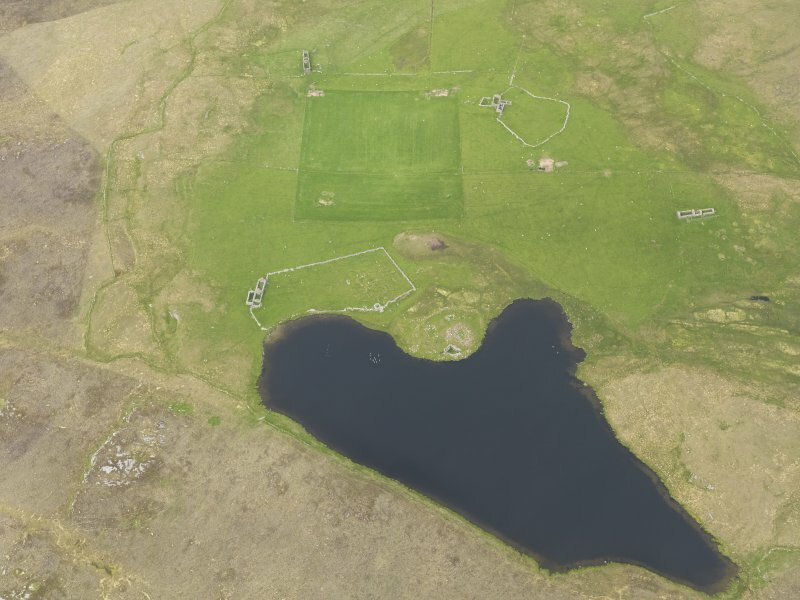 Oblique aerial view centred on the remains of the broch with the remains of the buildings, burnt mound and croft buildings adjacent, taken from the SSE. 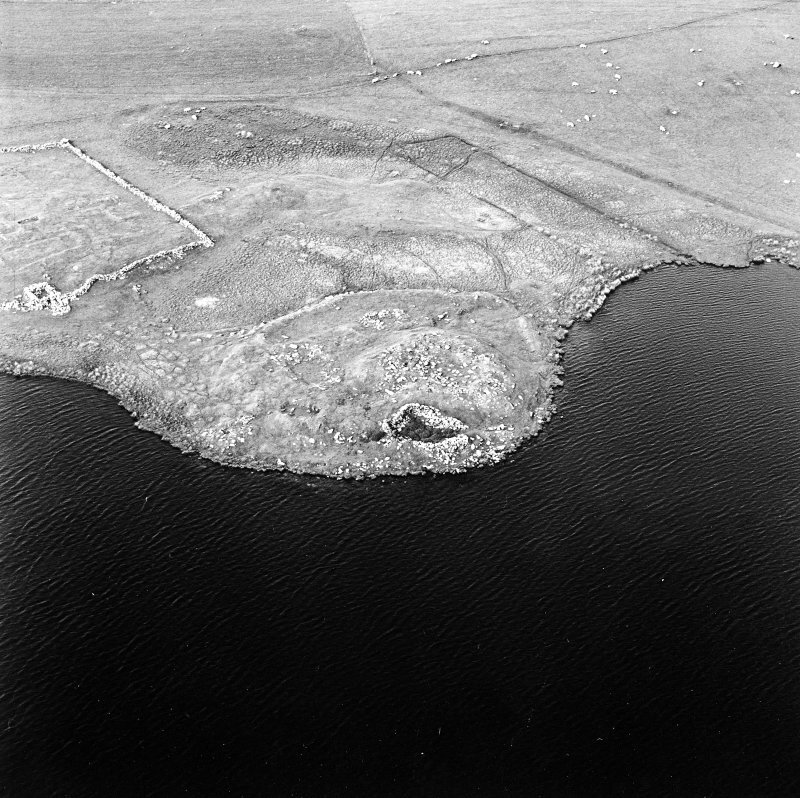 Oblique aerial view centred on the remains of the broch with the remains of the buildings and burnt mound adjacent, taken from the W.
Oblique aerial view centred on the remains of the broch with the remains of the buildings, burnt mound and croft buildings adjacent, taken from the SW.
Oblique aerial view centred on the remains of the broch with the remains of the buildings and burnt mound adjacent, taken from the E.
Oblique aerial view of the Loch of Snabrough Broch and the farmsteads, looking N.
Oblique aerial view of the Loch of Snabrough Broch and the farmsteads, looking SW.
Oblique aerial view centred on the remains of the broch with the remains of the buildings, burnt mound and croft buildings adjacent, taken from the E.
Oblique aerial view of the Loch of Snabrough Broch and the farmsteads, looking NNW. (HP 5682 0273) Sna Brough (NR). 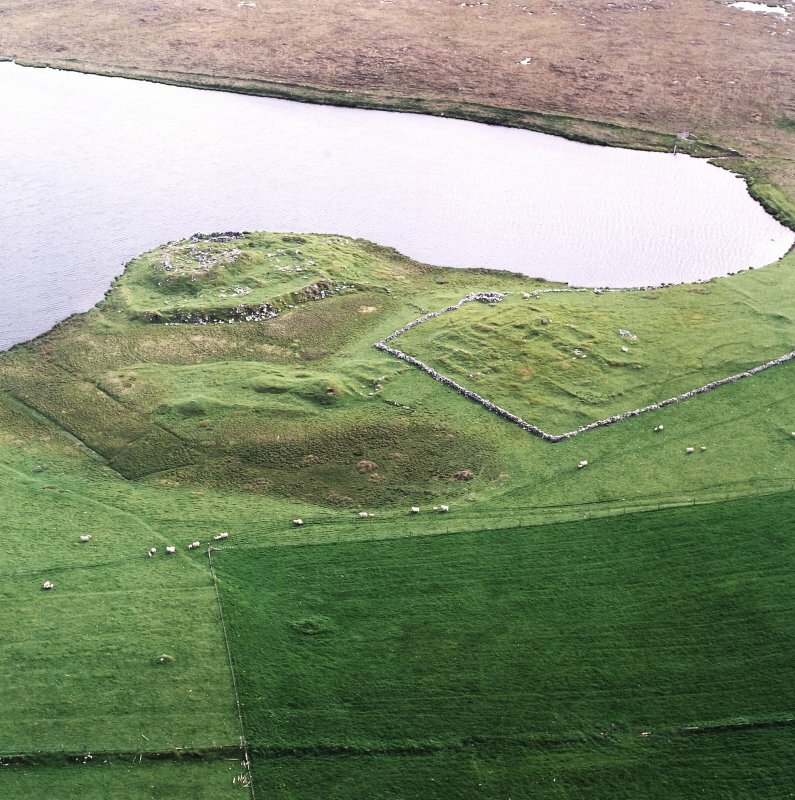 The remains of a broch, on a low-lying promontory, the lower levels of the main structure being largely buried under the grass-grown debris at its base. No precise measurements or details can, therefore, be given. The over-all diameter, however, must have been from 55' to 60'. On the SE, one can still trace the inner and outer faces of the broch wall, which has been 14' 6" thick at some distance above floor-level. The entrance, from the NW, is filled with debris, but the heavy lintel lying apparently in situ, although at the present ground-level, indicates its position. There are no clear signs of the large hollow apartments, oblong, widest at each end, and following the curve of the wall (Rev G Low 1879) which were still visible in the 18th century. 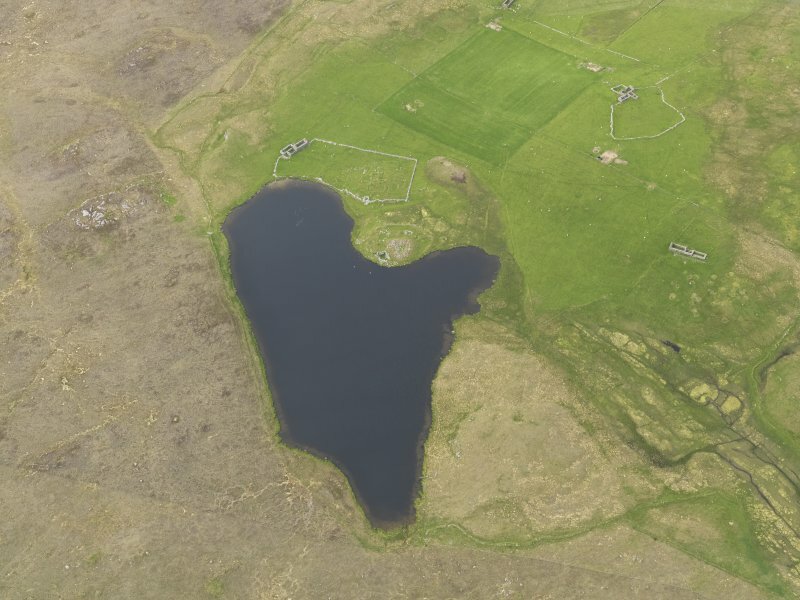 On the south side the loch afforded adequate protection, but on the landward side there was a strong wall or rampart and a wet ditch, both of which curved across the broad neck of the promontory. 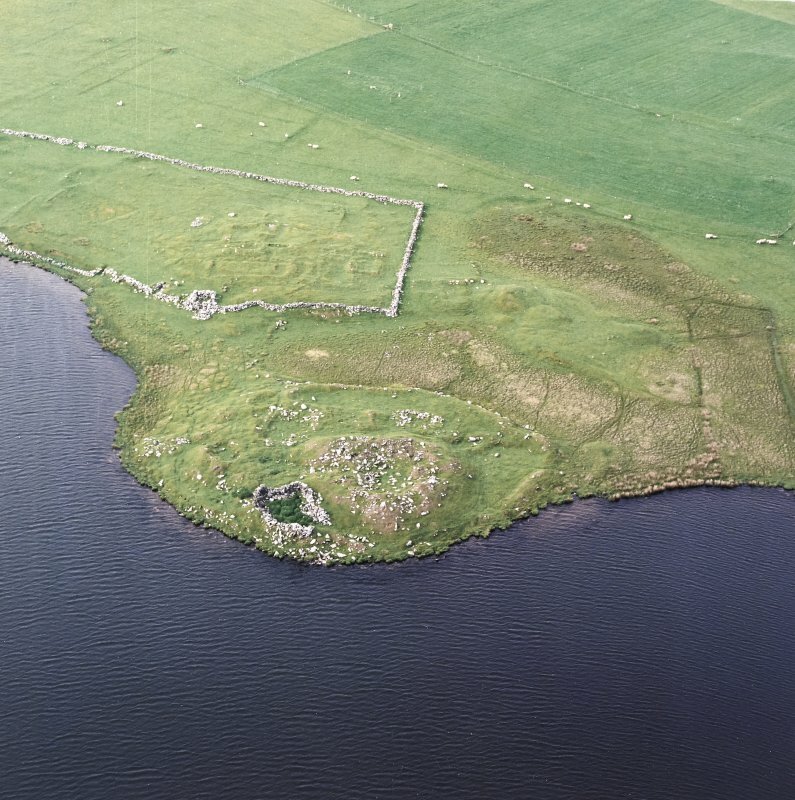 The former is between 30' and 35' distant from the outer face of the broch, and still rises to a height of 6'6" from the inner margin of the ditch. It is continuous but for a gap of 4'2" between the broch entrance and the inner end of a cause- way, which was presumably once submerged in the wet ditch, but is today dry and much over-grown. Between the outer wall and the broch there is some slight evidence of out-buildings but these are obscured by accumulated debris. G Low 1879; RCAHMS 1946, visited 1930. 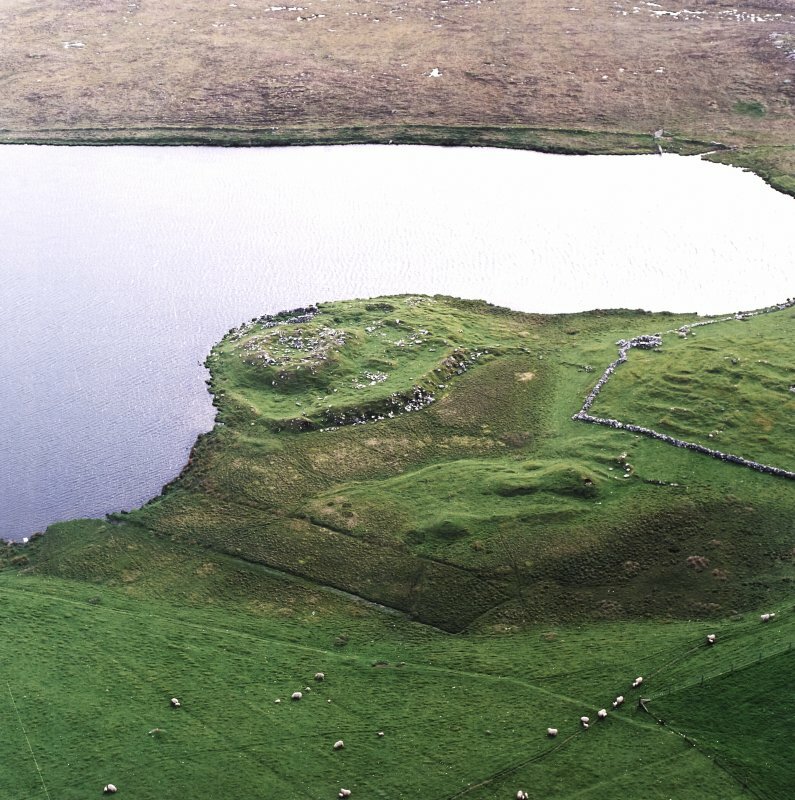 Sna Brough, generally as described by the RCAHMS. The corbelling of two chambers on either side of the entrance is visible. 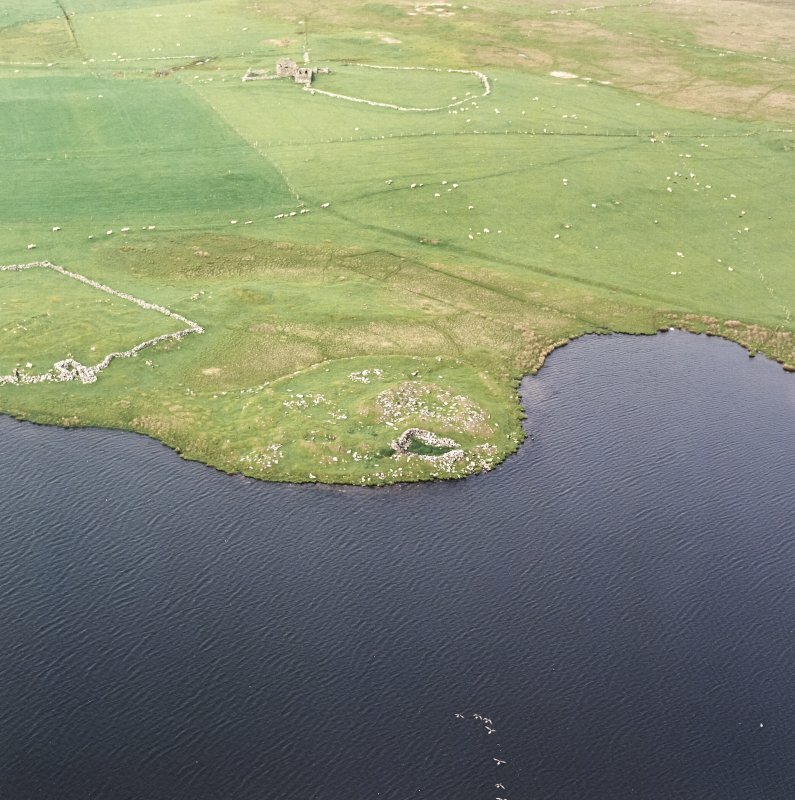 A low wall mostly obscured by tumble extends from one end of the outer rampart to the other, along the margin of the loch S of the broch tower. Visited by OS (NKB) 5 May 1969. 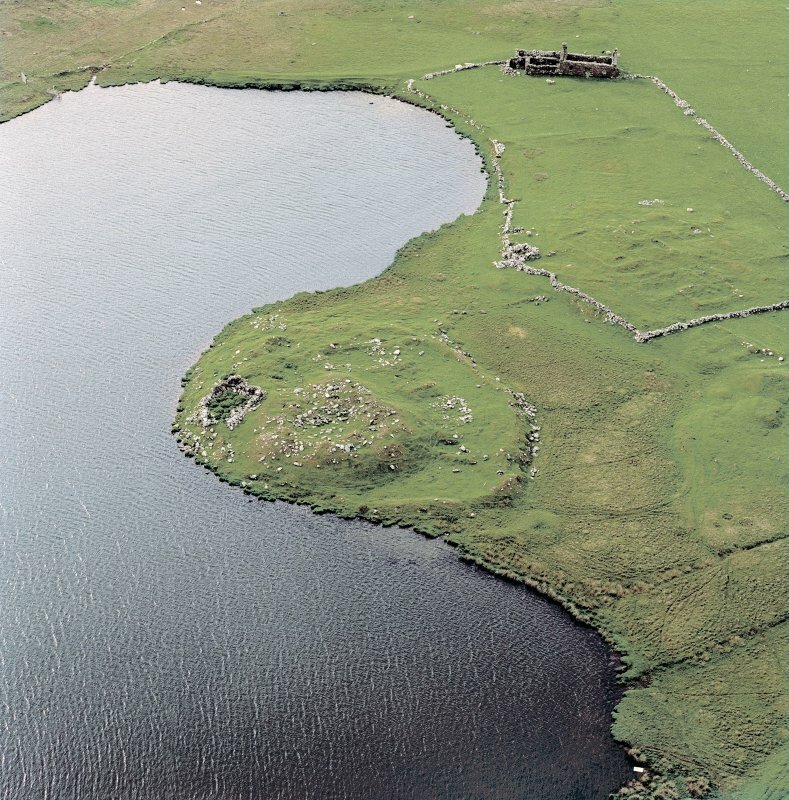 This probable solid-based broch on Unst, stands on a short, low promontory on the shore of the Loch of Snabrough. Few of its structural details can be made out now. 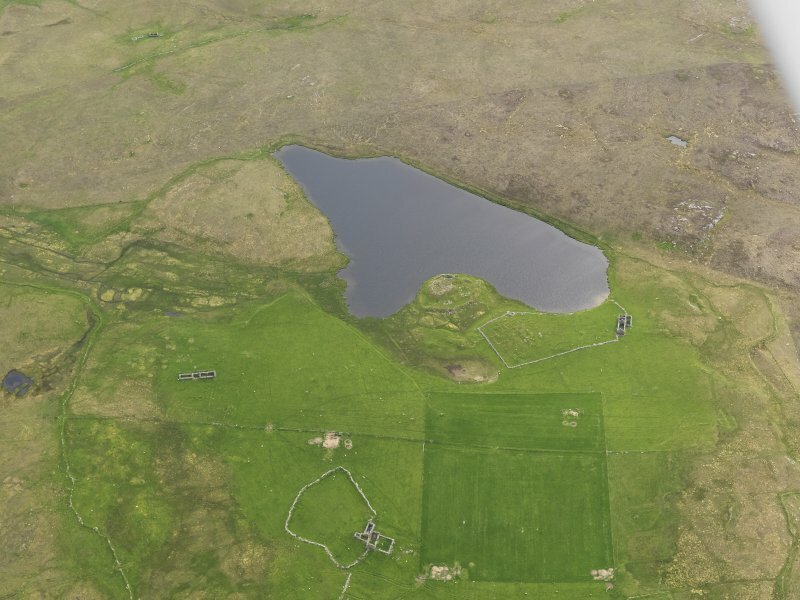 The site stands on rolling cultivable land in an open and exposed position except for the loch on the south side; elsewhere it is protected by an outer defence system. 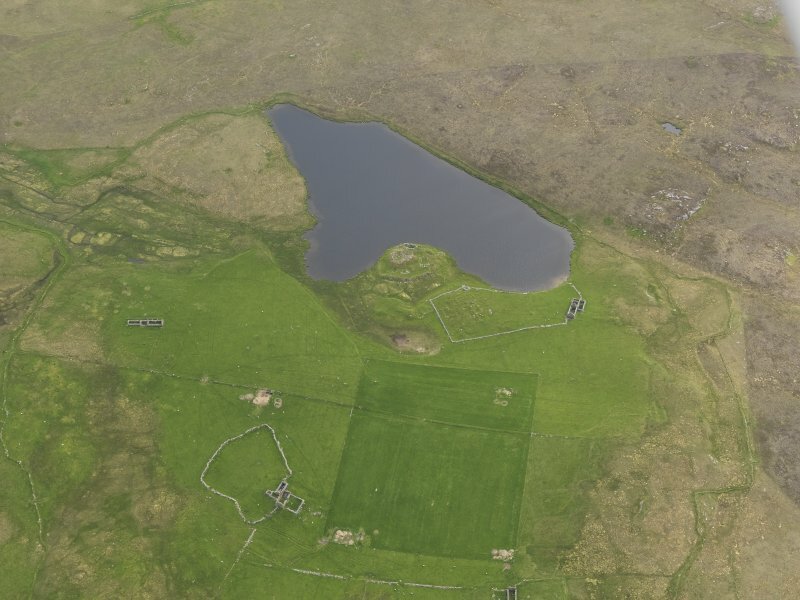 A strong masonry wall, or rampart with an external stone face , with a ditch outside it runs round on the landward side, across the neck of the promontory and from. 30-- 35 ft. from the outer face of the broch; it is still 6 ft. 6 ins. above the inner edge of the ditch. There is a gap in this wall in front of the broch entrance and in line with a causeway across the ditch. 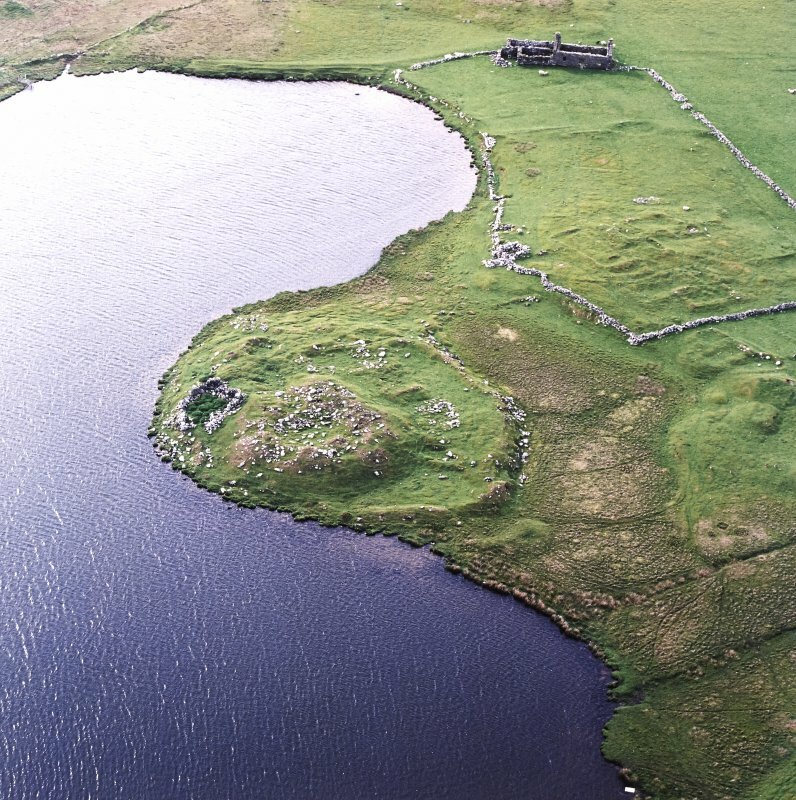 I noted that the wall also runs along the edge of the loch so that it completely surrounds the broch mound. 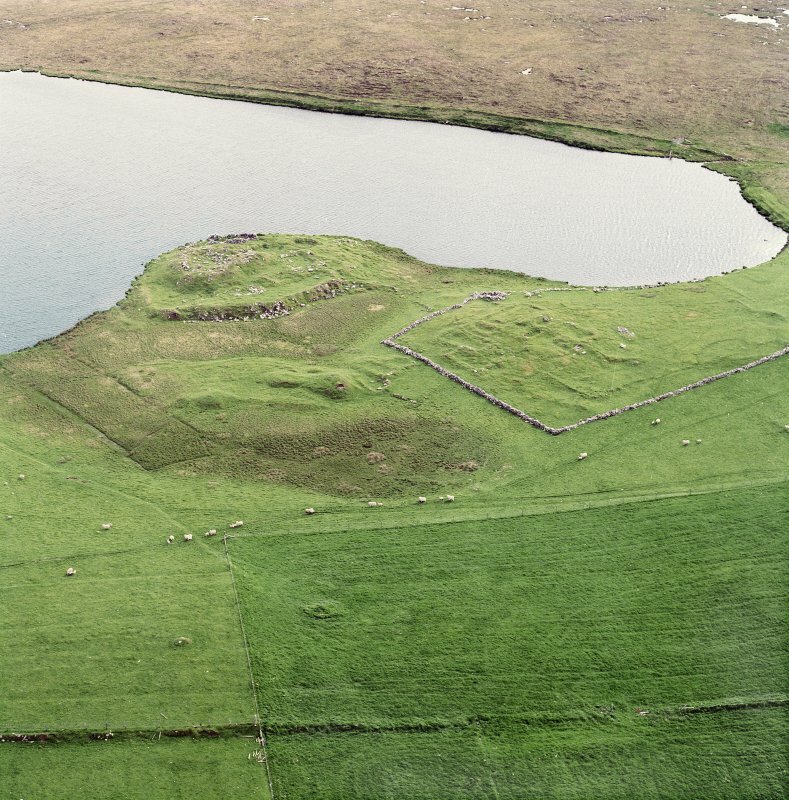 There are traces of outbuildings between the broch and the outer wall. Structural analysis: Level I: The Commission noted the inner and outer faces of the broch wall --14 ft. 6 ins. thick -- on the south-east, and the entrance on the north-west with a heavy lintel at present ground level though apparently in situ [4, 133]. The corbeling of two chambers on either side of the entrance was noted in 1969 . In the late 18th century Low noted "large hollow apartments ... following the curve of the wall" which are shown as mural cells in his plan [2, 152]; there are no signs of these now unless they be those just mentioned. Level II: the 1774 plan also clearly shows a segment of the first floor gallery on the north side, specifying that it is higher than the ground level storey with its cells. 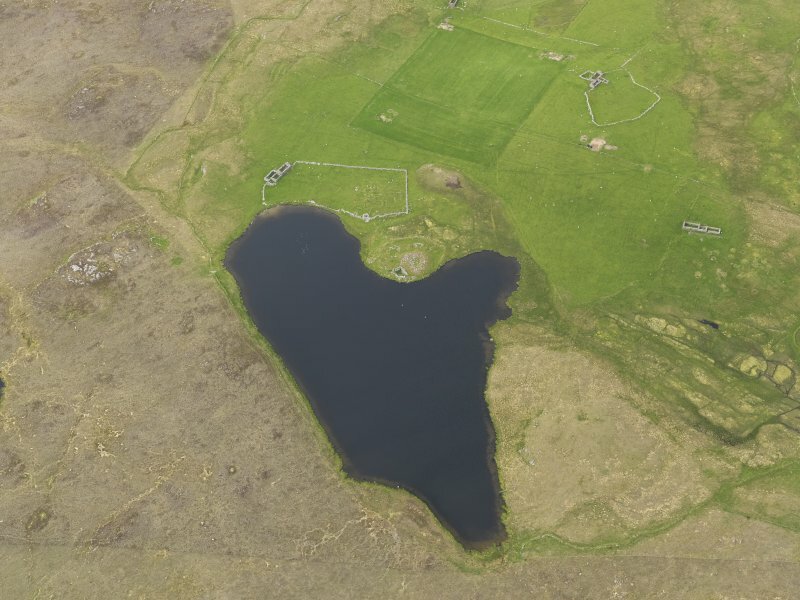 This clearly shows that the site is a hollow-walled broch. In addition the indication of a tall, corbelled guard cell on each side of the entrance implies at least one upper gallery, as at Dun Mor Vaul (NM04 4). Refs: 1. OS card HP 50 SE 8 (with sketch plan): 2: Low 1774, 151-52 and fig. 3. Hibbert 1822 398: 4. 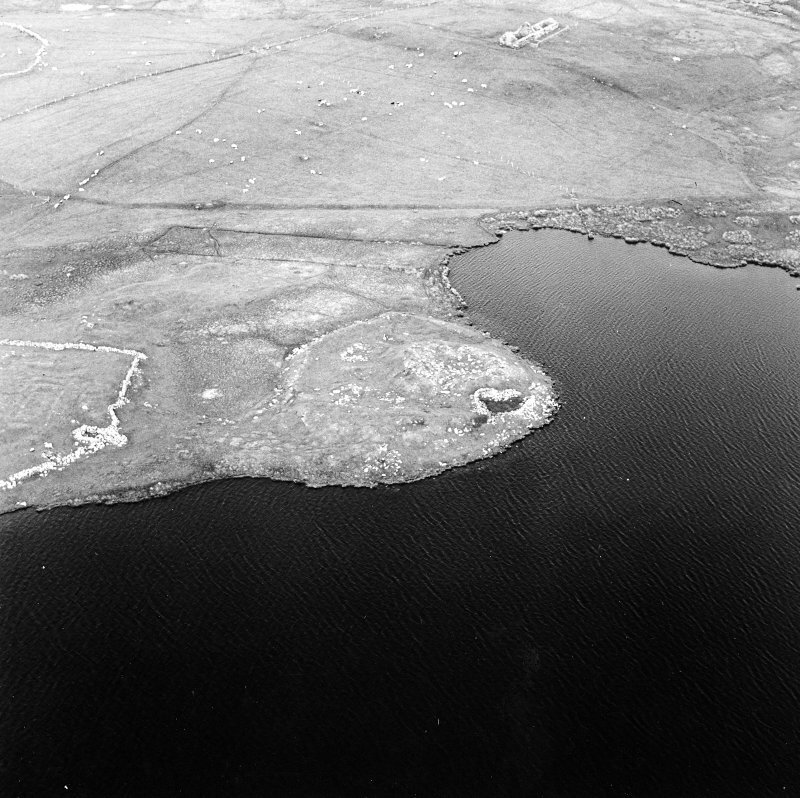 RCAHMS 1946, vol. 3, no. 1546 and fig. 660.